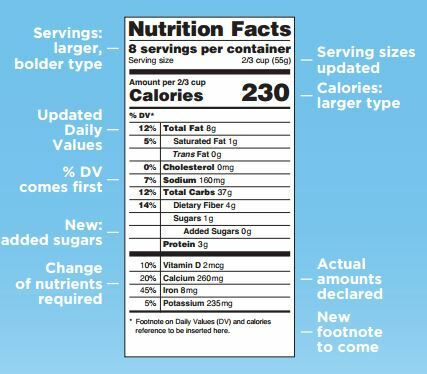 The FDA has proposed rules to the Nutrition Facts on food labels including changes to the format and appearance of the label and new guidelines on serving sizes. The comment period for these changes has been extended. Electronic or written comments may be submitted by August 1, 2014. A public meeting has been set for June 26, 2014, from 8:30 a.m. to 5 p.m. Eastern Standard Time (EST) at the Jefferson Auditorium, U.S. Department of Agriculture (USDA), Wing 5 Entrance, 14th and Independence Ave. SW., Washington, DC 20024. FDA encourages all persons who wish to attend the meeting to register in advance of the meeting. There is no fee to register for the public meeting, and registration will be on a first-come, first-served basis. Early registration is recommended because seating is limited. Register Now. 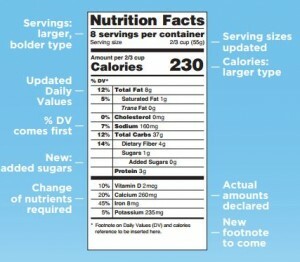 Thanks for finally someone noticing how hard it is to read some of these labels. Having been in food service for 30 years it will be advantageous for all who are monitoring values to eliminate foods that are not conducive to there health.